Each camp participates in daily events which are age and skill-level appropriate. All activities are safe and inclusive. Every camper brings their own skills and abilities with them to camp and we want to see them shine! Many campers have even discovered new activities they love and can continue to explore after the final day of camp. Some of these activities include: swimming, canoeing, water games, sports, themed meals, tuck, group skits, songs, short hikes, crafts, archery, and secret pals (shhhh). Camp Gitchigomee is a Christian camp. •Each person is valued as someone made in the image of God. Our staff work to ensure that this respect for one another is upheld and to help the whole community work and play together cooperatively. •Our focus is on making sure every child, adolescent and adult who interacts with our camp or staff feels the love of our amazing Creator and His followers. Whether you identify as a Christian or not, you are worthy of love and Camp Gitchigomee will welcome you with open arms, hearts and minds. •We strive to provide examples and encouragement for healthy, happy Christian living, but we recognize that alone, we are all imperfect. 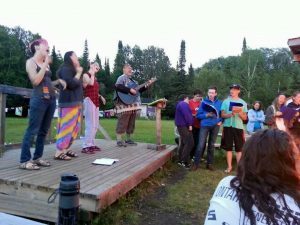 Camp Gitchigomee provides a safe space to ask questions, seek guidance and grow together in love and faith. See our Camp Philosophy page for more information. • We are proud of our Anglican roots but strive to provide what could be called classic Christianity in a contemporary form. Our inter-denominational staff work together to focus on central themes of the Christian faith: hope, faith and love. 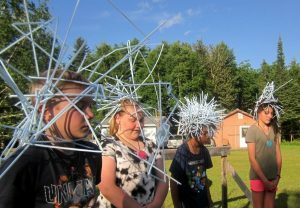 • Our cabin groups quickly become the foundation of a camper’s community during his/her time at our camp. Each cabin can sleep up to 16 campers and always includes at least two staff members, one of whom is always over 18. • Our camps are small enough that no one ever needs to feel lost in the crowd, while being big enough so that there are many new friends and supportive adults to meet. Our size is just right for every camper and staff member to participate in a secret pals program where we explore the importance of giving and receiving in friendship. 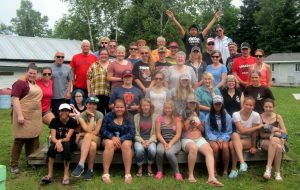 • Once you have attended Camp Gitchigomee, you are a part of the community for life. Every camper and staff member receives a small, painted log for every week s/he attends (as well as some off-season activities). As you continue to attend and grow with our camp, so will your log collection, which can be worn around your neck to display your connection to fellow campers, staff and the camp itself. Camp Gitchigomee cares about God’s Creation. • At Camp Gitchigomee, we are grateful every day for the gorgeous, natural scenery which God has created for us. We believe that nature is important for the physical, spiritual and mental health of all, so do what we can to preserve it. • We practice recycling as much as possible and never litter. When we go on short hikes or canoe trips, our aim is always to take nothing but pictures and leave nothing but footprints. • It is not uncommon for our Bible study or chapel discussions to direct our attention to the natural beauty surrounding us. As an option, nature study is often part of the program, and can include bird watching, stargazing, tree and plant identification, and water-creature observations. Camp Gitchigomee is a safe camp. 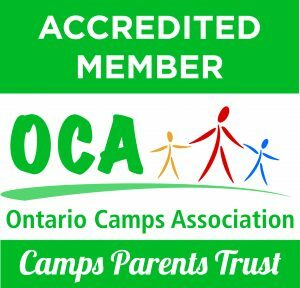 • Campers are supervised day and night and are not allowed to go past camp boundaries or beyond buildings except with staff as part of an organized camp activity. • The legal standard for First Aiders on site is adhered to, and most camps have a Registered Nurse spending the week as well. 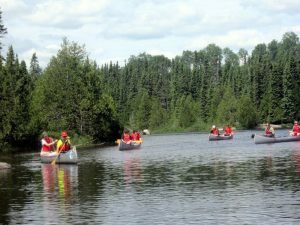 • A qualified Waterfront Director and a team of lifeguards supervise swimming, canoeing, and all water activities, as according to Ontario regulations. • All staff go through a detailed screening process, including reference checks and police record checks (for those over 16). • A thorough evacuation plan is in place for the highly unlikely case of a serious fire or extreme weather. • Our site is nut-free and we are inspected at least once every summer by a Government Health Inspector to ensure that health and safety regulations are followed in and out of the kitchen.